All users of any app want increased performance with every upgrade, and users of Parallels Desktop are no exception. Lets go through three of the performance improvements in the recently released Parallels Desktop 12. Of course, there are different kinds of “performance improvements”. The most common type is a speed up of one of the basic operations of the app. In the case of Parallels Desktop, an example of this would be an improvement in the boot time for a Windows virtual machine. Another type of performance improvement would be a change in the workflow of an app so that you can accomplish the same task in less time. A third type of performance improvement would be a decrease in the amount of time the app requires for app maintenance like updating the app to a new release. This is time that the app “takes away from you”. I will describe an example of each of the three types of performance improvements in Parallels Desktop 12. 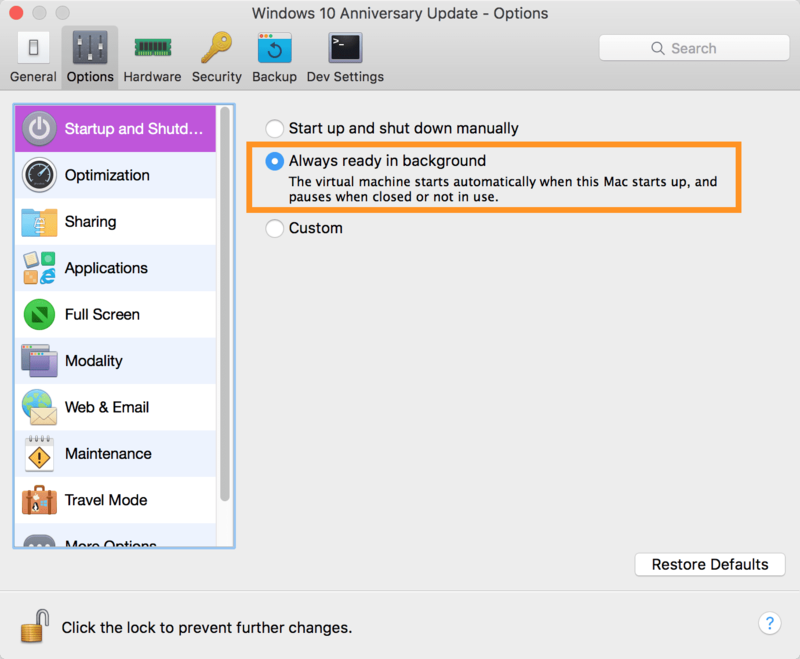 To shorten the boot time of VMs, Parallels Desktop 12 has added a new setting, “Always ready in background”. Each test was done after a re-boot of the host, plus a minute or two of “settling in” time. As in the tests, the Mac was re-booted before capturing the video, and I aligned to two videos on the click on PowerPoint in the Doc. As an example of a workflow improvement, Parallels Desktop 12 has added new app settings for Windows apps, shown in Figure 2. These are all modeled after similar settings in the Mac OS for Mac apps. 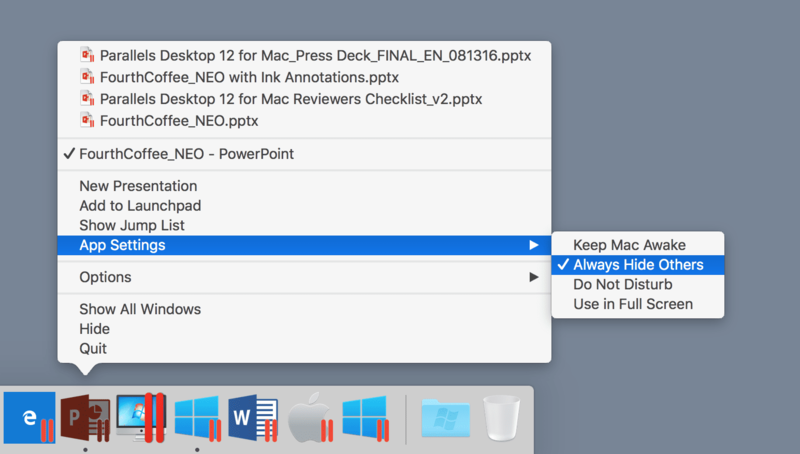 The “Always Hide Others” setting for Windows apps in Parallels Desktop 12 hides all other Mac or Windows apps so that you can focus on the task at hand. This setting, available only in Coherence mode, is a “sticky setting” that remains in effect until you change it, until the Mac setting, which only lasts until the app is quit. For me, whenever I have a short deadline task, there always seems to be a big Windows update to download, install, and then re-boot Windows – and these actions can significantly cut into the time I have to meet the deadline. 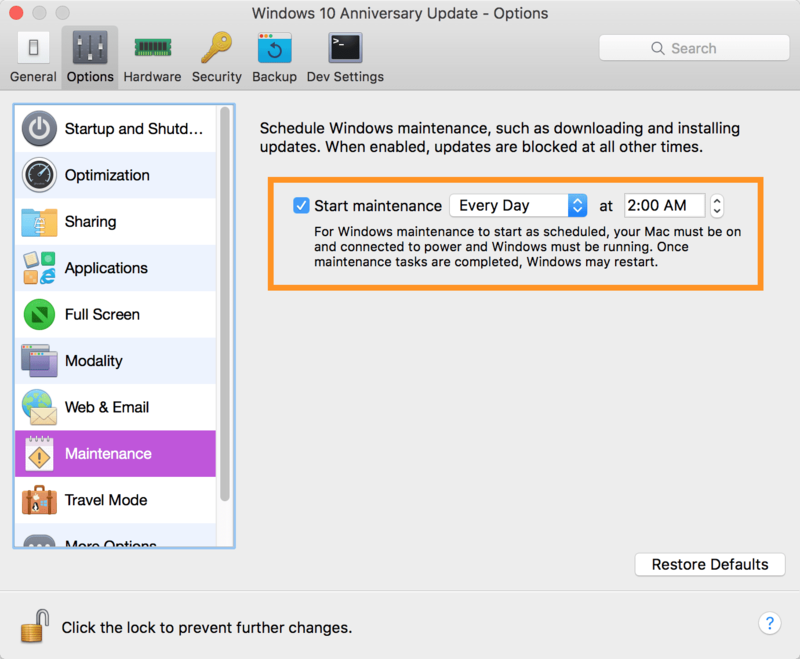 Parallels Desktop 12 now includes a Scheduled Windows Maintenance setting so that Parallels Desktop can download and install any Windows or Office updates, and reboot Windows. (See Figure 3.) In this way, you “get back” the time that the update would have taken from your workday. Unfortunately, there is no way to make a video showing this performance improvement. However, the next time there is a Windows update to install, just imagine if this had all been done while you were asleep. While there are other performance improvements in Parallels Desktop 12, these are the three that will probably affect that greatest number of users, and thus are the ones you can look forward to when you upgrade.